According to a new report LAMEA Cloud Orchestration Market (2017-2023), published by KBV Research, the Latin America, Middle East and Africa Cloud Orchestration Market is expected to register a CAGR of 25.1% during the forecast period (2017-2023). 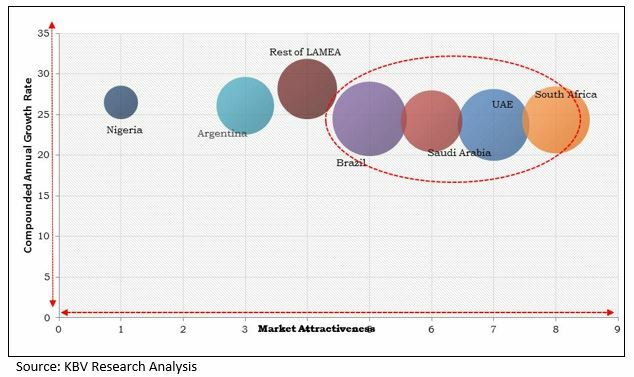 The Brazil market dominated the LAMEA Cloud Orchestration Portable Service Market by Country in 2016, and would continue to be a dominant market till 2023; growing at a CAGR of 25.7 % during the forecast period. The Argentina market is expected to witness a CAGR of 27.3% during (2017 - 2023). Additionally, The UAE market is expected to witness a CAGR of 25% during (2017 - 2023). The BFSI market dominated the Brazil Cloud Orchestration Market by Vertical in 2016, and would continue to be a dominant market till 2023; growing at a CAGR of 22.3 % during the forecast period. The Telecom & IT market is expected to witness a CAGR of 25% during (2017 - 2023). The Healthcare & Manufacturing market is expected to witness a CAGR of 26.3% during (2017 - 2023). Additionally, The Media & Entertainment market would attain market value of $18.5 million by 2023. The report has exhaustive quantitative insights providing a clear picture of the market potential in various segments across the globe with country wise analysis in each discussed region. The key influencing factors of the Latin America, Middle East and Africa Cloud Orchestration have been discussed in the report along with the elaborated company profiles of IBM Corporation, HP Enterprise Company, Oracle Corporation, Cisco Systems, Inc., Amazon, Dell (Vmware, Inc.), DXC Technology (Computer Sciences Corporation), Red Hat, Inc., ServiceNow, Inc., and BMC Software.